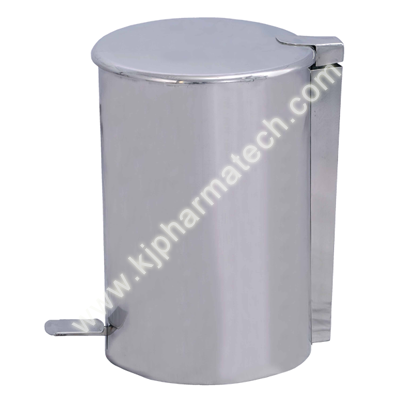 One of the major essential objects for clean room is Dustbin and we offer high quality and robust SS Foot Operated Dustbin of diverse capacities. These have been manufactured with the aid of latest technology to ensure they have optimal finishing as well as sturdiness with good permanence since they do not corrode or rust. Since these dustbins can be opened and closed by foot, it offers ease while working and enhances efficiency. These are designed to be compact occupying minimal space. These are not just optimal in their usage and call for simple maintenance but offer decent appearance to the place they sit in. these are quality tested to make sure that they can be operated for ages in an effortlessly smooth manner. We offer these in different dimensions as well, as per the need of the clients. We offer them at very affordable rates. 492/2 GIDC Makarpura, Near Himalaya Machinery, B/H Chandan Complex, Vadodara -390010, Gujarat (India).